Minutes after Laura Muir had smashed her own personal best and Dame Kelly Holmes’ British 1500m record, the Scot had no qualms about recognising how significant that moment would be for the remainder of her career, no matter what she might go on to achieve. On a Friday night of memorable performances at the Müller Anniversary Games, the 23-year-old ran 3:57.49 to cut more than a second off the 3:58.66 she ran during Genzebe Dibaba’s world record run in Monaco last year, showing her growing confidence on the world stage to throw down the gauntlet and run the legs off of world bronze medallist and world indoor champion Sifan Hassan of the Netherlands in the final 200 metres. Aiming for a sub-four-minute season’s best, Muir admitted that Holmes’ iconic 3:57.90 set during her gold medal-winning run in Athens 12 years ago was always something which had been in her mind. “It had been something I’d looked at but I’ve always said to myself I don’t run for times. I run for places and run for medals. To get the record along the way, it will be one of the biggest achievements of my career. I know I’m only 23 but that will be a big one up there,” said Muir. “We went through at about four-minute pace and then I managed to take two-and-a-half seconds off. To do that shows how strong I am to make the latter half of the race faster. I’m just over the moon. It’s not just any record, it’s Kelly Holmes’ Olympic gold medal record. “I was keeping a close eye on the board to see where everybody was. I knew [Hassan] was with me but I knew I had really good strength. I knew if I pushed the pace and kept pushing hopefully that would take it out of her legs. Luckily it worked and I just had to try and stay strong on the home straight. Elevated to second in the world rankings for 2016, Muir’s phenomenal run will have lifted her even higher in the reckoning for a medal in Rio. 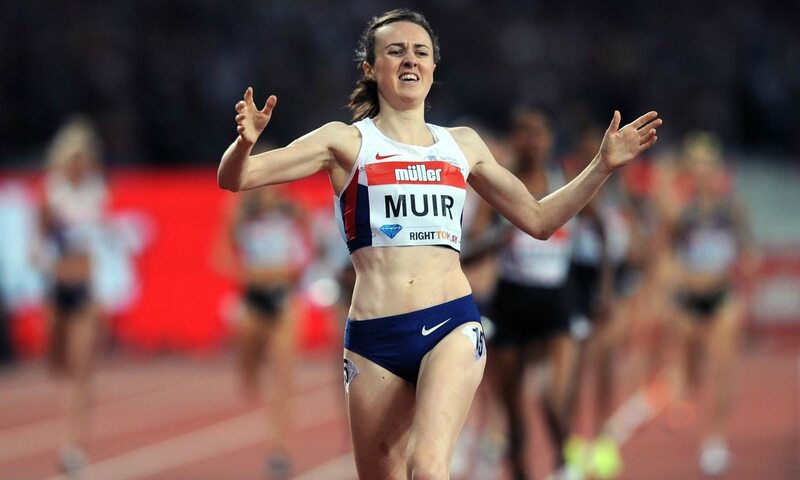 As she’s proven time and time again Muir is prepared to work herself into the ground to produce results, and issued a warning to her competitors in Rio that it will take all they’ve got in Rio to break her resolve. “I was confident already going into Rio but to get a Diamond League win on home soil with the record, that couldn’t have made my confidence any higher,” she added. The added confidence of a British record, on top of an outstanding 2015 in which she finished fifth at the World Championships, has shown in Muir throughout her season so far and is reflected in her no-fear mentality. “You’ve got to have that mentality. If you go into a race thinking you’re going to lose. That’s not a great mentality. You’ve just got to go in there and think you’re going to do the best you can. If you do that then happy days,” Muir said.